Hello, I am working on a 3D printer with a heated chamber and I have found a pair of fans I would like to use. I am pretty inexperienced with PWM control etc, so I am reaching out for some advice as to how to connect things and if I will need additional circuitry to run these fans. A picture of the fan data sheet is linked below. I read through this article on fans: https://duet3d.dozuki.com/Wiki/Connecting_and_configuring_fans and it stated that drawing more than 1.5 amps per output isn't recommended, but a startup current of 3-4amps is permissible. My question is could I used the fans I want and just run them at a slower speed so I do not exceed the maximum operating current of 1.5amps? Thank you! How big is the chamber, how much power does the heater use, and why would you need a pair of such monstrous fans? It takes very little air movement to distribute the warm air in the chamber, and only a little more to screw up your prints. You don't want the chamber fans to act like print cooling fans. My printer has a 420 litre chamber volume. It has a 500W heater to warm the chamber with a standard 24V, 5" fan to blow air over the heater bar so that its temperature doesn't get to a dangerous level. 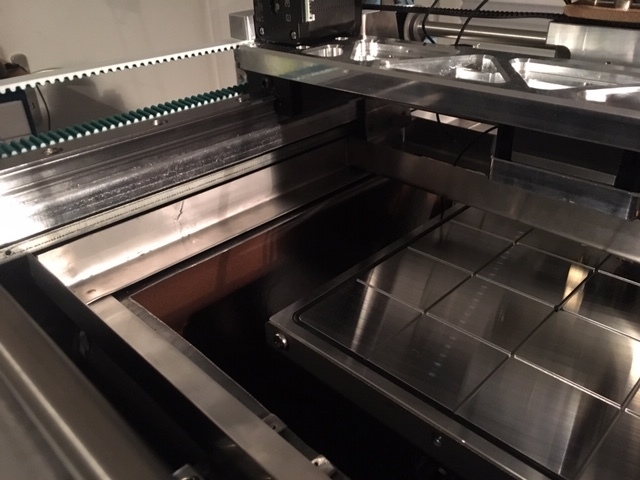 It takes about 15 minutes or so to get the chamber up to 50C for printing ABS, which is more than fast enough. It usually takes that long for the first few layers of a print that will benefit from the chamber heat to finish. I operate the fan from the SSR drive signal that turns on the heater. When the heater is on the fan runs and when its off, it doesn't. Very simple, and it doesn't create a hurricane inside the chamber. IRIC, the chamber temperature is PID controlled. In this photo, the heater is at the right rear corner. The fan is wired in parallel with the SSR control input, connected directly to a MOSFET output on the Duet board. Warm air rises via convection that will tend to turn over the air in the printer chamber. Make sure all the fans (hot-end and chamber heater) in your printer are rated for your chamber operating temperature. Cheapo fans will fail quickly at 50C or more. Here's the wiring- the line input ground, not shown, connects to the printer's frame (and to the 24V supply input and output grounds). Thanks for the throughout reply, the reason I chose those fans is not because I need the amount of air they move, but because of their high temperature rating of 150C. 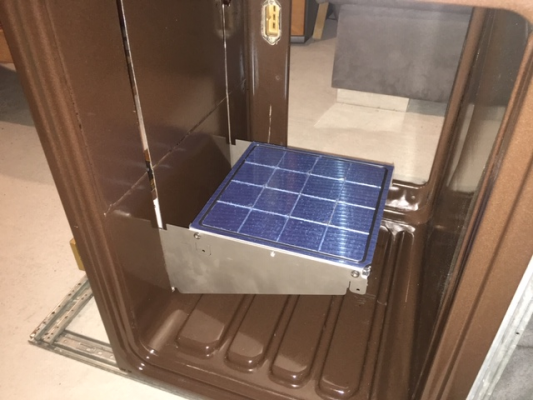 I am trying to get my print chamber near the glass transition temperature of ULTEM 1010 (186C) and polycarbonate (around 130C) had a difficult time sourcing and smaller high temp fans. In terms of the heating elements I am using, I have two 400w finned heaters like yours from an old Stratasys machine. The build volume chamber dimensions are around 20x14x18in. I also was able to salvage properly rated SSR's from the power distribution board on the Stratasys machine as well. The bit of advice on how the chamber fans shouldn't act as print cooling fans is helpful, I did not fully think that part out. Maybe a cheaper and less disruptive option would be sourcing a metal blower fan wheel and attaching it to a smaller actively cooled motor steel shaft. If you know of any suppliers that stock hightemp fans that are not too big let me know. 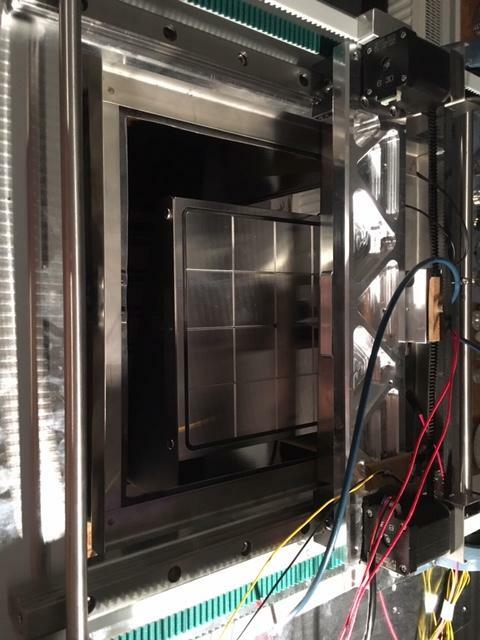 I think the only way to operate a fan in a 150C environment is going to be putting the motor on the outside of the chamber with a shaft going through the wall to the fan blade, as is done in convection ovens. You'll probably have to use a bronze bushing as a bearing, and some sort of coupler to keep heat from creeping through the shaft to the motor. When your chamber temperature is at the glass transition temperature of the material you are printing, you probably want to have a "cooling"/circulation fan which blows air onto the print because the melted material should cool down to the glass transition temperature. New layers should also be printed on the plastics with glass transition temperature. You don't want to print the layers on melted/liquid materials. As @mrehorstdmd suggests, the convection oven arrangement works well. I've made my heated chamber like that, and it is then very easy and cheap to source the heater and fan. Just make sure the heater compartment is nicely insulated like they do in the back of ovens, and use a thermal cutout. Choose a heater with a relatively low power rating , because most oven heaters would be over the top (often 2-2.5kw). I use a 1400w heater and it raises the chamber to 70degC in 4-5mins. Of course it could heat the chamber to 250degC like your cooker if you let it! (hence the importance of a suitably rated thermal cutout) I have my steppers outside the build chamber, but even so a lot of my other bits (belts, bearings, fans etc) inside aren't rated at temps above 80degC so I haven't gone as high as you are planning. Sourcing high temp components seems to get difficult, and I have been limited by that. The only problem with the oven fans is that you can't use PWM to control their speed. I keep it on full, all the time the heater is being used, just like your kitchen oven does. I'm using the oven setup as well, having the motor shaft poking through the bottom of the insulated build chamber, the half moon shaped heating element around the blades of the fan, and a sheetmetal cover to keep everything away from the blades. The heater element is controlled via SSR and a single thermistor at the top of the build chamber. Hence the temperature of the heater itself will be much more than the temperature the chamber is seeing, probably same as in a real oven. 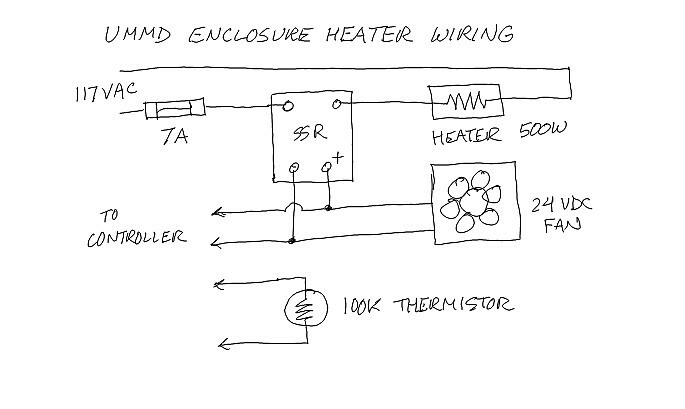 @pawPrinter why shouldn't you be able to control the heater via PWM? I'm doing so with the aforementioned setup. The heater is rated at (I think) 1700 W and set to 70% power cycle. It heats the chamber to about 180 °C in under an hour. This setup works fine; I had the temperature sensor directly attached to the heater, basically as you would have in the hotend, but the real temperature inside the build chamber would be way lower and not controllable. @dc42 One drawback is that Paneldue doesn't show and control chamber heaters. You have mentioned before that this doesn't have priority. Maybe you might reconsider, as I feel that more and more people are thinking about this? Actually any fan will fail faster if you run it at nominal power and above max temperature. If you reduce the power by a factor (f), it should work longer. It the materials allow this. In HVAC we usually take a step bigger motor than needed. But we try to avoid these situations, because there are other components that fail. @pawprinter have you tried playing with the PWM frequency with the F parameter? You might have luck getting it to spin with higher or lower than the default. Up to 30000hz can sometimes help. @pawprinter I'm just noticing that I totally misread your post - I thought you were talking about the heater, which, of course, you can switch and control via Duet by SSR. But the fan is a whole different story. This is getting a bit OT; but if you're using the kind of oven fan I'm using, then its motor is AC and you can't just control that via PWM. You'll need a special controller that converts the Duet's PWM signal via phase angle control for example. I have a manual speed controller installed that I set to a fixed value (e.g. it's running all the time) and just control heater power. 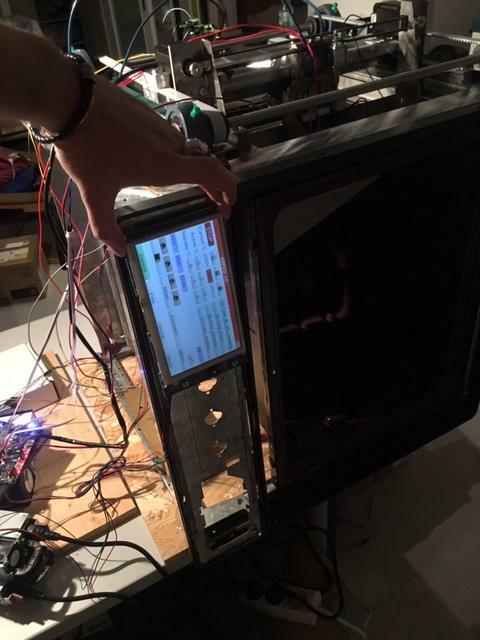 I decided, instead of just piecing together pieces of an oven, to just build the printer into the oven. I am also waiting for the integration of the heated chamber into the PanelDue, as well as a vertical orientation option for the PanelDue. If there is interest, i will start a build log. @Phaedrux Thanks, I didn't think about changing the frequency. I'll give it a go. @mrehorstdmd Interesting post. I have a similar printer that has a setup like this from the factory. It's a creatbot D600 Pro. I am finding that the blower fan is far too powerful on bang-bang mode and it causes banding in my prints. When I PID tune the chamber heater (which triggers the blower fan just like your setup) it works really well and the temp is super stable and prints look great. This however causes the lights throughout my entire home to "pulse" or "flicker", I wouldn't consider it a dimming. Have you seen this behavior at all with your setup or are you getting by with bang-bang mode fine? I've seen this reported quite commonly with beer brewing kits that use heating elements with PID control and cause lights to flicker, but I'm still uncertain what the fix is. @sonderzug How stable is the chamber temp in your machine like this, how much does the temp fluctuate in there? @darkstarone experiment with the PID frequency of the heater. I had to reduce the frequency of my bed heater to 10hz to stop my pot lights from flickering. @phaedrux I did try this on a very wide range and unfortunately none of them seemed to help. I've actually just disconnected the blower fan from the SSR and wired it up as "Fan 2" on the duet and leaving it set to about 10% all the time, and put the heating element on bang-bang, will see how this works out. It looks like I actually have the chamber heater running in bang-bang mode. I haven't seen any lights flickering, but it's only a 500W heater. I haven't seen any problems with prints because the heater and fan are located about 700 mm below the XY stage. Even if the air is moving at the bottom of the printer, there's not much movement at the top. 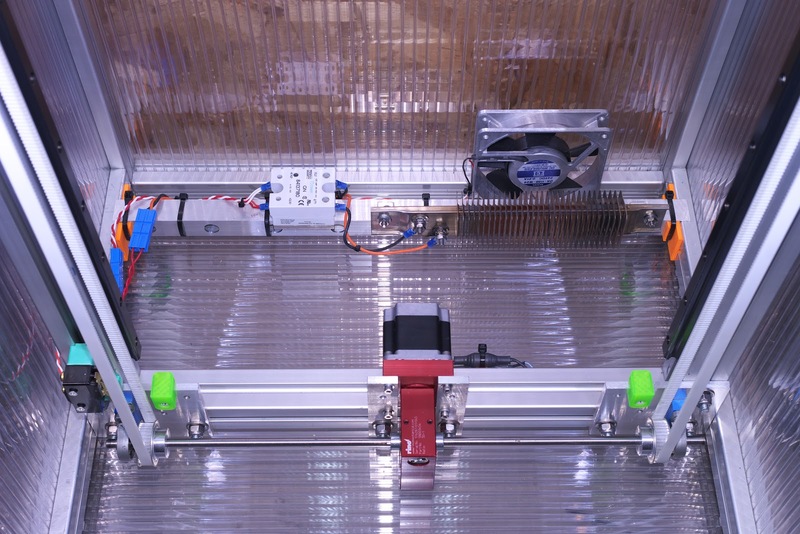 When the bed is all the way at the bottom of the Z axis, the fan is below the bed surface, so it won't be blowing air directly on the print, though it may tend to cool the bed plate a bit. I haven't printed anything that tall in quite a while. The fan I used isn't a particularly high flow type. So is it the blower, or the heater that's causing it? You can adjust the PWM frequency for both. That must be one intense blower in that thing. It will be the heater. Turning a high powered heater on increases the load on the electricity supply, which will cause a drop in supply voltage due to the resistance of the supply wires. It's likely to be worse using 110V mains than 230V, because the current is double (unless the heater is wired between the two phases, so that it gets 220V) and your lighting is twice as sensitive to voltage drop. Even so, with the 240V mains here, whenever we turn the microwave oven on the lights dim momentarily. Some types of lighting are more sensitive to mains voltage than others. I would expect non-dimmable LED lamps to be less sensitive than most other types of lamp, but I haven't done any tests. There are two ways of controlling power to AC heaters: the phase shift methods, and the burst-fire method. Phase shift is what light dimmers do, on each half cycle of mains they pass only part of that half cycle to the load. But phase shift devices distort the electricity waveform, so the power companies don't approve it it being used for controlling heavy loads. Burst fire means that complete half-cycles are passed to the load, or not. It's kinder to the electricity generator, but likely to cause flickering of associated lighting. When you use a zero-crossing DC-AC SSR to control a heater, you get burst fire control. If you want phase shift control instead, see this thread https://forum.duet3d.com/topic/9397/ssr-with-analog-input/2. The Crydom MCPC analog SSRs are phase shift controllers.